After filling my freezer with my recent lamb delivery from Cutter Ranch it came time to cook my first meal. Kept it real simple. 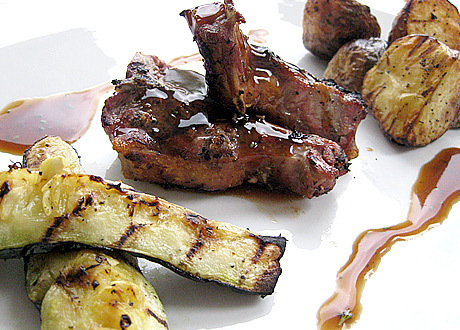 Tossed the lamb, potatoes and zucchini in oil and fresh Rosemary and let marinate for several hours. Fired up the BBQ/grill and cooked to perfection. Added a little Rosemary gravy and sea salt and we were good to go. After the first mouthful (during which, time halted to a mouth watering foodgastic standstill), my wife said “now this is what lamb should taste like”. Sad in a way that we have got use to ‘generic’ meat from the supermarket, but appreciative of the quality, organic, grain fed lamb that we now have. Cutter Ranch are now taking orders for next year. We will be for sure be ordering more. I’ve been looking into buying partial cows, pigs & lambs lately…I’d love to get in on this next time around. I’m assuming the meat is delivered packaged in portions good for 2 or 4? could you let me know what your 1/2 consisted of? thanks! I, too, was lucky enough to experience the pleasure of tasting Cutter Ranch lamb, having just finished an order of half a lamb from last fall.I wish everyone could have a chance to see how mild and tender lamb can be when it’s raised with the love and care that goes into these animals. There’s none of that strong gamey flavour that frozen sheepbricks from New Zealand used to have, or cooking smells that tell you a block away there’s lamb for dinner. These are healthy happy critters that are raised the way food should be, here in our own virtual backyard.